The Irish know it as a Shamrock. The rest of us just think of it as a lucky four leaf clover. 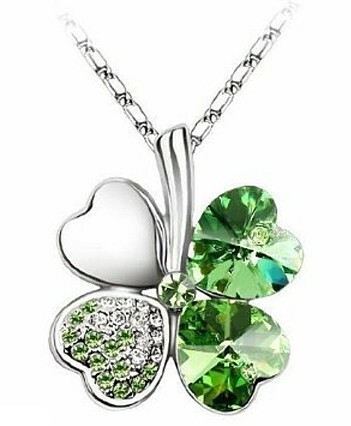 Either way, this cute little good luck charm is both a delightful lucky talisman to be wished upon and held in esteem, or a charming little Swarovski crystal necklace. The Be Lucky necklace is a testament to texture and colour. The design features two petals bearing pale emerald green heart-shaped Swarovski crystals, a third petal encrusted with tiny clear and pale emerald green Swarovski crystals and the fourth petal has a silver finish. All threaded on an ultra shiny, slinky 41-46cm (16-18") Mirror Box chain. Size: 2.5cm x 2.3cm (1" x ¾"). What's so lucky about a four-leaf clover? "Well, numero uno, they're so incredibly rare, you're lucky to find one! About 1 specimen in 10,000 of Trifolium repens - or white clover - has four leaves instead of the usual three. Saint Patrick was said to use the shamrock, or three-leaf clover, to teach about the Holy Trinity. Whereas the four-leaf version is supposed to stand for faith, hope, love and luck. According to Science, the reason for this incredibly rare fourth leaf is genetic. It's purely down to a recessive gene!